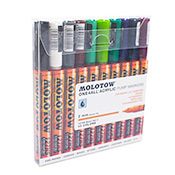 Molotow's 127 set includes includes 10 x ONE4ALL 127HS in the secondary color palette. 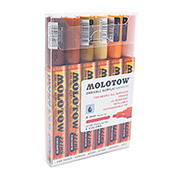 Each marker is equipped with the exchangeable 2mm Round-Tip. The set is packaged in a clear box with product information on the front and backside.